in 1936 G. W. Giles with an M.S. 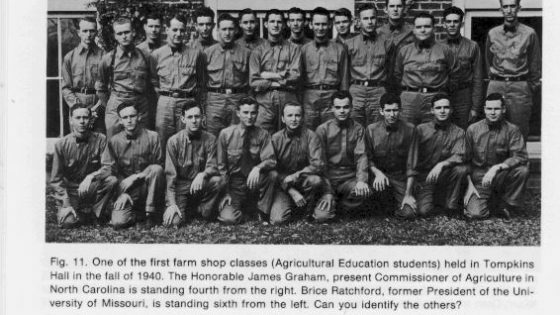 degree in Agricultural Engineering from the University of Missouri joined as the sole teacher for 1 year while Weaver was on a year’s leave as Principle Engineering for the Federal Rural Electrification Administration. R.R. was established in 1935 by a Congressional Act. At that time only 11 percent of the U. S. farms had electricity. Some assistance had to be provided. North Carolina had one of the nation’s first rural electrification Administration. R.R. was established in 1935 by a Congressional Act. At that time only 11 percent of the U.S. farms had electricity. Some assistance had to be provided. North Carolina had one of the nation’s first rural electrification programs with D. S. Weaver and Jane S. McKimmon of Home Economics as the main leaders. Giles continued on following Weaver’s return in 1937, and remained with the department until 1961 with the exception of about 2 years during World War! During the later period he taught Diesel Engineering to U.S. Navy Ensigns in a special school on the campus. In the early years the teaching budget was meager, something on the order of $250 per year, outside of salaries, and completely out of line with needs. For example, it is recalled that the total equipment allocation for 1 year less than $50. The shop needed a ½- inch portable electric drill to supplement THE HAND TURNED ONE. The purchase order for this one item took all the equipment money for that year. “You folks spend money like it was water,” was one reaction to that purpose. Eventually this simple recognition led to specific appropriations. 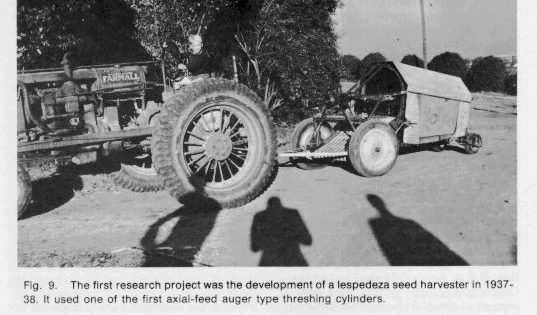 It started out in an instructive way when Giles in 1937 on his own initiative, without formal approval, used his free summers (teachers were paid for 9 months only) and his own money to work on the lepedeza harvester shown in Figure 9. Local junk yards were the source of materials. This activity was not wasted, even though the machine never amounted to much; however, to our knowledge it was the first axil-flow threshing principle which is used today commercially. One day Director Winters said “If you are that dedicated and firm in your belief of the need for improved equipment, I am going to allocate a few hundred dollars out of my contingency fund,” Later, under the prodding of D. S. Weaver, Giles and notably E. R. Collins of the Agronomy Department, appropriations were provided Agricultural Engineering for the development of a one-row mule-drawn cotton planter. The “One Mule Farmer Needs a New Machine” was the lead line. Collins was a co-leader. Thus was born not only a truly cooperative research project between and another campus discipline, Agronomy, but also an avenue for direct and continuing appropriations for research. The resulting machine shown in Figure 10 was produced commercially by the Blue Company of Laurinburg, N. C. The mule-drawn machine, however, really never “got-off-the-ground.” Tractors were on their way and progressive farmers turned their attention in that direction. Three benefits did result: appreciation by farmers of the potential of higher yields and more efficient use of fertilizer, recognition that often that leadership lags the realities of the time, and that it is most difficult to help the subsistence level farmer adopt more costly advanced technologies. It is interesting to note that the drive gears were fabricated with teeth of round rod screwed into flat plates—they worked like a charm. Particular credit must go to L. D. Baver, a young soil scientist, who was appointed Associate Director in 1940 and Director of the Experiment Station in 1941. He recognized the need for expanding research in Agricultural Engineering and saw to it that an increased yearly budget was provided, including additional staff. Laboratory, classroom and office space remained a critical problem for many years following 1940, brought on in research staff. Extension was taken care of fairly well with office space and coordination in Ricks Hall. Weaver maintained his office there. Many moves took place for the instructional and research groups. The first was from Patterson Hall to the judging pavilion attached to the rear of Polk Hall. Imagine a class of students sitting on concrete bleachers attentive to a teacher surrounded by a jungle of gas engines, drafting tables, instrument lockers, etc. Lacking sufficient space the Farm Shop was broken out and moved to Tompkins Hall, where it was jointly administrated and financed by Agricultural Education and Agricultural Engineering. Agricultural Education furnished the space and the equipment, and did so generously. This endeavor must be recorded as another truly cooperative on-campus venture. Figure 11 shows one of the fall 1940 classes. Particular credit must go to J. K. Coggins of Agricultural Education. He and Giles made this one of the outstanding shops for its purpose in the United States. The program was excellent and a highlight of the times for Agricultural Engineering. Today the shop is back in the Agricultural Engineering building with even finer facilitates and programs under G. B. Blum, Jr. and E. L. Howell (see Figure 35). Their work is a shinning example of teamwork. Blum has B.S.A.E. and M.A.E. degrees, and Howell the same but in Agricultural Education, all from N. C. State University. Shop course work was required for both Agricultural Engineering and Agricultural Education students. From the livestock judging pavilion the physical plant, with the exception of the shop, was moved to a newly built wooden structure southwest of Polk Hall, where the Bureau of Mines and Cox Hall building now stand. It was built mainly with second hand lumber by the maintained department of the College and was proclaimed as “taking care of Agricultural Engineering”. However, its small size and dirt laboratory floors hardly befitted the needs of a growing important university discipline. The floor was gradually concreted on a “do-it-yourself” basis. About 1944 there was pressure for a U.S. Bureau of Mines building to be built in the existing Agricultural Engineering location. The availability of U.S. Government money prevailed and Agricultural Engineering was moved to a wooden structure located along Western Boulevard just east of the existing Forestry complex. The building had been abandoned by the National Youth Administration of the depression years. Its some 10,000 square feet of floor area, including two offices, was heated by two pot-belied coal-fed stoves. Yes, we wore coats while working in the winter. The situation was depressing. From the NYA shack period, however, everything was on the upgrade. A. F. Hendricks, B.M.E., M.S. Medical Engineering and B.S. Electrical Engineering all from the University of Tennessee was hired from TVA in 1942 to teach courses in farm equipment. The degree man, as he was called jokingly, also did some research in sweet potato harvesting. He resigned in 1944 to join ARS-USDA. N. C. Teter, Associate Professor, was hired in 1942 as the department’s first full-time researcher. He earned a M.S.A.E. degree from Iowa State College and was on the staff there before coming here. He was hired for farm structures and drainage research. One of his main projects was on the value of crop residue for insulation purposes. This product was in line with one of the American Society of Agricultural Engineers recommendations, “development of farm crops for industrial uses.” Army services interrupted his work from 1944 to 1946. After returning he started the first research work in North Carolina on artificial curing of peanut and plant tops in contrast to curing on the stack pole in the field. Numerous alternatives were investigated with Giles handling the field mechanical operations and developments. This included clipping the tops in advance of digging. One exciting approach, harvesting the green nuts in one trip, will be covered later. A new building for drying research was constructed on the Upper Coastal Plains Research Station at Rocky Mount. In 1947 the Turner stationary peanut picker was converted for combining from the windrow. The department’s first outside financial assistant in support of study on a problem in connection with the pursuit of an M.S. degree called “Research Assistantship”. The Scott-Viner Co. of Columbus, Ohio supplied a beet harvester and money for the position. The goal was to harvest the peanuts in a once-over operation and dry them from a green state. The rear of the machine is shown in the door of the shop, See Figure 18 further down the page. The once-over harvesting principle was a “first” for the world—really a pioneering effort that was ahead of its time. Work has continued elsewhere but the rising cost of drying from a completely green state has been an insurmountable obstacle. T. H. Garner, having earned his B.S. degree in the department in 1952, was the recipient of the first assistantship. Under the program he earned the M.S. 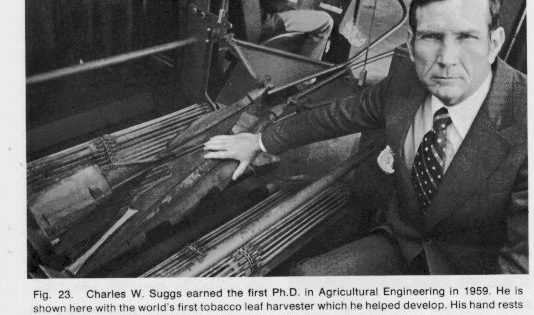 degree in 1956, and was immediately promoted to instructor—to work full time on cotton mechanization research and to teach a power and machinery course. Having aspirations for more education he dropped back to one-fourth time in 1960 to pursue work leading to the Ph.D. degree. In 1962 he resigned to join the Clemson University faculty. However, he continued to pursue the degree efforts by commuting, summer work, etc. We cite Gardner’s academic accomplishments because he represents so many students of that era who so cherished the value of education that few obstacles were insurmountable. The Lilliston Corporation of Albany, Georgia sponsored the department’s second outside-financed Research Assistantship starting in 1953. It was for investigations of pertinent aspects of mechanical harvesting such as cylinder speed. The recipient was W. T Mills who earned a B.S.A.E. degree from the University of Georgia in 1949. He came to us at the completion of a tour in the U.S. Army. In 1955 he completed his M.S.A.E. and continued on as a faculty member until he resigned as Assistant Professor in 1961. Yes, he was hired by the Lilliston Co. as Research Analyst. The Lilliston Assistantship was also terminated at the same time. During his tenure here he made the first departmental use of high speed photography—the peanut picking action of various principles. Another worker in the peanut mechanization was B. M. Cannon, Research Assistant Professor who came to us from Georgia in 1952. He resigned in 1954 to go into commercial feed processing. Teter resigned in 1952 to do research at the Virginia Research Station at Holland. He was replaced by J. M. Dickens who had received his M.S.A.E degree here is the spring of 1955 under an instructorship position. Dickens had served as superintendent of the Whiteville Tobacco Research Station and assistant superintendent of the Oxford Tobacco Research Station before returning for his M.S.A.E. He has remained with the department but as an employee of the ARS-USDA. He represents one of the fine examples of our relationship with the U.S. Government research organizations. More will be said later about Dickens federal-state peanut work of resent years. Also the systems approach using the computer will be described later. E. O. Beasley, who earned his B.A.E. here also worked on the project while pursuing his M.S.A.E. degree. He received the latter in 1964. In 1964 he resigned his Research Instructorship to join Holding Technical Institute as Instructor. 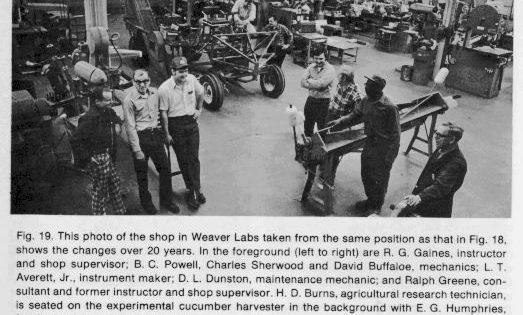 He returned in 1967 as Extension Assistant Professor to work in the farm machinery area. Pest control, cucumber, horticultural and general crop mechanization received his attention. 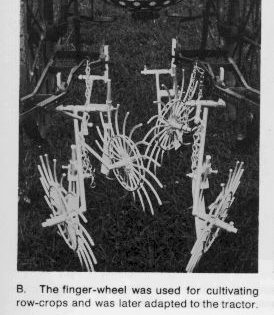 He is shown in Figure 37 see chapter 3 with one of his later research and demonstration projects—a reduced tillage planter. It subsoils, beds and plants in one trip on old cropland that has been leveled by discing. Conventional plowing, etc., are eliminated, tome and energy saved. Actually Beasley occupied the position that Ferguson vacated when he retired. As an Extension Specialist Ferguson had been involved in peanut mechanization work almost from the beginning. Mostly it was in connection with the field days for farmers, first at the research station near Rocky Mount, later at a new station near Lewiston, N. C.
The net result of all this effort and similar endeavors in other peanut growing states was a two-step windrow combining operations, partial drying in the windrow and lastly artificial drying. The system is used by almost all farmers today. Labor cost were reduced by 80 percent and only two persons were needed for the harvest—a notable contribution to peanut production and processing operations. 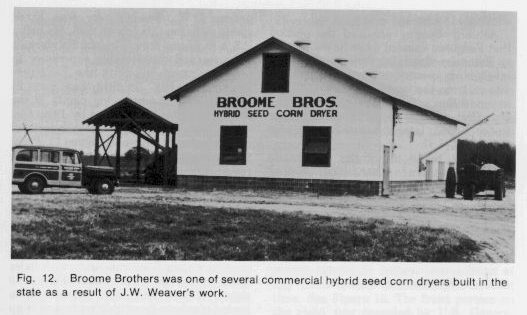 Hybrid corn development was underway in the 1940’s and the need was soon felt for supplemental drying for commercial purposes. J. W. Weaver, Jr. was hired specifically for this job in 1945. He had a B.S.A.E. degree from Virginia Polytechnic Institute and considerable experience in barn curing of hay with the Tennessee Valley Authority. By 1949 there were 21 corn-drying and processing plants in the State. This number doubled by 1952. Ones of the commercial dryers Weaver assisted in developing is shown in Figure 12. From the corn work he moved into hay-drying research work in cooperation with C. D. Grinnells of the Dairy Husbandry Section of the Animal Science Department. His “drying in the bale” work was unique. This was done in the barn, on hay wagons and on a specially designed platform in the open. Most successfully was drying in a covered wagon filled randomly with bales from an ejector type baler. 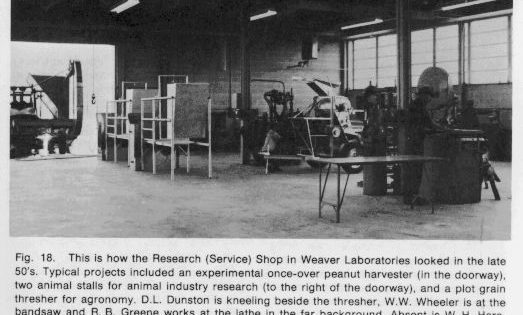 Figure 13 shows Weaver and E. S. Coats atop a loaded platform dryer talking to a visiting group. This photo serves to show the team work among the Agricultural Engineers. Coats graduated here in 1950 with a B.S.A.E. and joined the department as Research Assistant working with Weaver on a hybrid corn storage project at the Plymouth Experiment Station. In 1951 he was promoted to Extension Specialist to work on the processing of the state’s major crops: grains, peanuts, hay and tobacco. He also assisted with the 4-H Club Farm Electric Program. In 1961 he went into private practice as a Consultant in the crop processing field. 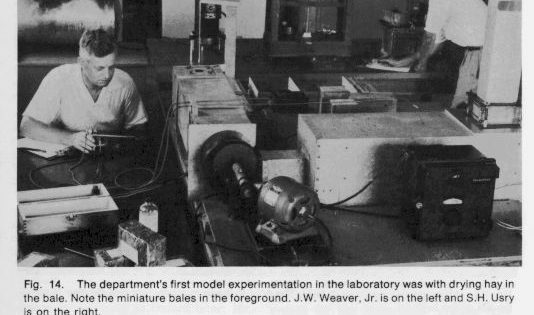 Weaver is credited with started the department’s first venture into the modeling technique of experimentation. Figure 14 shows some miniature bales and reduced-size drying equipment. This approach allowed one to control variables, such as air temperature, more precisely at less cost than when using full-size field equipment. J. W. Weaver, Jr. is in the foreground and S. H. Usry in the back. Usry was Assistant Professor and assistant with the Processing research from 1947 to 1956. Previously he was with the S.C.S. and had earned a B.S. in Engineering from the University in Chapel Hill in 1934. He left to join the N. C. State Board of Health, working on mosquito control. Weaver ended his career by teaching full time and retiring in 1969 after 26 consecutive years with the department. 1946 marked a special upturn of fortunes with the first of five appropriations coming directly form the General Assembly for a satisfactory physical plant. The farm leaders and the university officials began to sense the need for more engineering applied to agriculture. 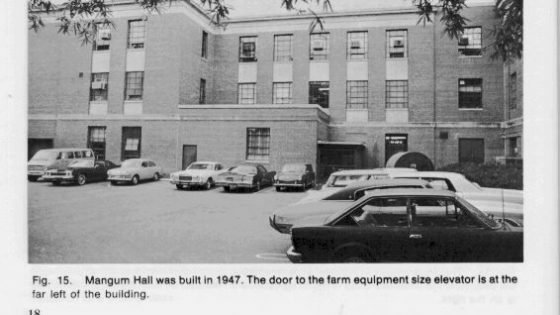 The first appropriation was used to build a three-story wing as an addition to what is now known as Clark Hall, but at that time housed U.S. agricultural agencies such as the Soil Conservation Service. Consisting mainly of a stack of three large laboratories, with two offices on each floor, it proudly sported an elevator that could accommodate the largest and heaviest of any farm tractor manufactured at that time. See Figure 15. The front portion on the right was occupied by U.S. Government Agricultural Agencies. Completed in 1947, the wing contained about 20,000 gross square feet of floor area. The appropriation was $108.000. We retained possession of the NYA building, using it for storage until it was dismantled in 1959. In 1948 Weaver was selected as Director of the Agricultural Extension Service. 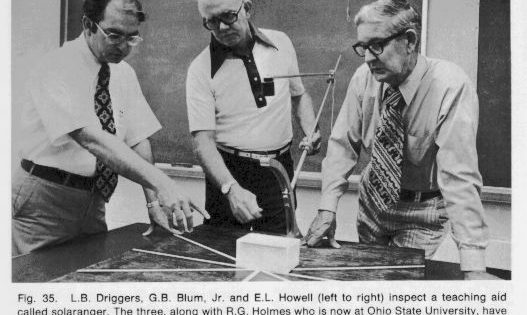 To fill his place Ellis (figure 4) was promoted to “In-Charge” of Agricultural Engineering Extension, and Giles (Figure 28) as the Head of the department which at the time involved the teaching and research aspects only. Extension was nicely quartered on the top floor of Ricks Hall, while teaching and research occupied the new building. The new wing to Clark Hall was named Mangum Hall in honor of the inventor of the first broad-based terrace. This terrace was constructed near Wake Forest in the year 1885. The Department, Extension and the ASAE Student Club were instrumental in getting a historical marker placed along N. C. Highway 98 near its location. 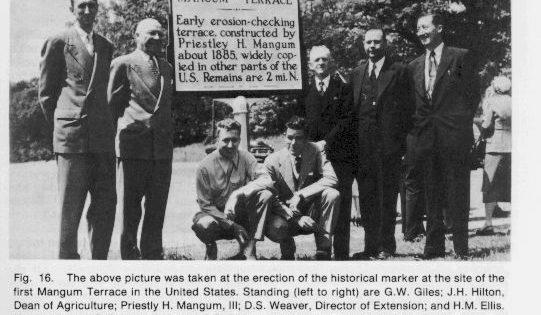 Figure 16 shows some of the officials who participated in the dedication flanking the marker. 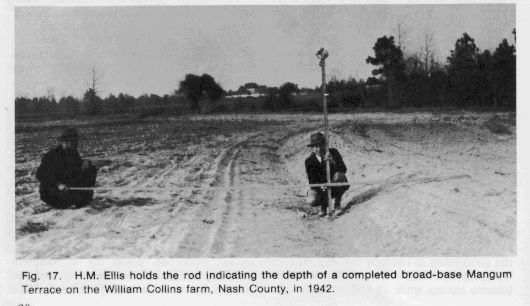 Figure 17 shows a cross section of a Mangum terrace constructed under the supervision of Ellis in Nash County in 1942. When finished the drainage channel on the uphill side would measure horizontally approximately 14 feet. The backslope would also be gradual so that the entire terrace could be farmed. This type of terrace was improved over the years by widening both the channel and the downslope base. This was possible because larger power earth moving equipment became available, thus supplanting the animal drawn type. The hope was that the building connected to Mangum Hall on the front, consisting mainly of offices and meeting rooms, would eventually become a part of the department. These aspirations were to be denied, however, and having no space to expand at that location a major decision was made to strive for additional appropriations to start anew at a location having expansion opportunities. This completely new venture, in effect turning our back on Mangum Hall, required a lot of help beyond the university officials. Some, but by no means all, of the agricultural leaders who sensed the validity of this new approach were S. T. Proctor, farm equipment dealer of Fuquay-Varina and a leader in the N. C. Farm Equipment Dealers Association; R. F. Shaw, Executive Vice-President of the N. C. Farm Bureau; B.C. Mangum, farm equipment dealer and successor to Shaw; J. E. Eagles, a member of the N. C. House of Representatives form 1961-1969 and a farmer in Edgecome Co.; J. C. Eagles, a tobacco warehouseman of Wilson. They gave tremendous help and support to the cause. N. W. Weldon, a research staff member working on tobacco curing at the Oxford Research Station, was especially effective in helping to get this second appropriation and the third one as well. In recognition of his contribution a color portrait hangs in the main lobby of the now existing Weaver Laboratories. More will be said about the tobacco curing work at Oxford later. Mr. Weldon remained on the research faculty until he retired in 1960. He passed away in 1972. The second appropriation, for an expansive-type building, was secured in 1953. It amounted to $400,000. The building was completed in 1957. It provided a floor area of about 37,000 gross square feet. Pursuant to plans, the new building was started at the corner of Dan Allen Drive and Western Boulevard. It was really unwanted space at that time and considered by many to be “off-the-campus.” Also a major transmission electrical power line with massive steel support structures transversed the area, and was located in the only direction for the University to expand ground wise. Admittedly, the second appropriation was used to spread out as much as possible in order to “nail down the territory,” so to speak. However, plans for a complete building were made at that time and approved by the University officials. The third appropriation amounting to $350,000 came in 1957 for approximately 34,000 square feet. It was completed in 1960. The money was used to fill in some of the vacant spaces and to add the administrative wing in front. See No. 2 in Figure 31. The research shop was moved into more spacious quarters in the new first unit. Figure 18 shows a corner view at that time. Three typical projects are identified in the caption along with three of the mechanics. R. B. Green, Head of the Shop, is the man on the lathe in the North Carolinian accepted the position in 1943, coming here from Purdue University. The shop’s name does not truly convey its wide range of activities. It actually serves many other departments, except class instructions. We appreciated the vitalness of good shop equipment and mechanics to fabricate, and repair—yes, to contribute ideas, too. Recently, new road signs that grace the entrance to the outlying experimental research stations were made in this shop. Greene had one charge, “to develop the best equipped and managed shop for such purposes in the nation.” With a budget under his control, he did exactly that. And, he did it almost starting from scratch around the pot-bellied stove of the abandoned NYA shack. He retired in 1973 holding the position of Instrument and Shop Supervisor and with five-full-time mechanics under his supervision. Greene was replaced by R. G. Gaines who earned a B.S. Degree in Agricultural Engineering Science in 1966 in the department. Following graduation he had worked with E.G. Humphries on cucumber and sweet potato harvesting and H. D. Bowen on electrostatic dusting and plant-growth studies. Figure 19 shows the shop as seen today; the photo was taken from about the same position as shown in Figure 18. All the shop staff appear in the foreground flanked by Gaines on the left and Greene on the right. The shop staff are identified by name in the caption. In the near background is an experimental cucumber harvester built by the shop. Humphries, project leader, is standing beside the machine and technician H. D. Burns is in the seat. The privilege of working in the shop was encouragingly extended to all faculty and graduate students of the department. During all this concern with a physical plant the importance of acquiring highly trained additional professional staff for upgrading and expanding teaching, research and extension education remained at the top of the priority needs. Table I in the Appendix indicates that in 1976 the total faculty and staff amounted to 80. The faculty were recruited from all parts of the United States, as well as North Carolina. This philosophy of bring in “outsiders’” so to speak, started in the 40s and was viewed with skepticism by some at that time. In no way did this detract from excellence contributions of those who were born and educated in North Carolina and remained with the department. They are: C. F. Abrams, Jr., E. O. Beasley, G. B. Blum, Jr., J. W. Dickens, H. M. Ellis, J. C. Ferguson, J. W. Glover, R. G. Gaines, E. L. Howell, E.G. Humphries, W. H. Johnson, R. E. Sneed, C. W. Suggs, W. C. Warrick and R. W. Watkins. They and their work are mentioned throughout this historical recording with pride. It is believed that this department was a leader in the nation in planned intermixing faculty members of various training and geographical backgrounds as opposed to hiring a majority of one’s own graduating natives. This intermixing policy resulted in a total team of greater strength and values unachievable by other means. In 1976, and beyond, the uncontested emphasis is clearly on filling vacancies with the best equipped talent whether from North Carolina, the nation of the world. The philosophy as expressed above must be recorded as one of our great achievements during this first 60 some years. Two other faculty, one in teaching and one in research were employed from outside the state. One was I. L. Williams who came to us as Associate Professor from Louisiana State University in 1947. He had earned a B.S. from Texas A&M and a M.S. from Iowa State University. The second was E. N. Scarborough, Research Assistant Professor in 1948. Scarborough had just earned his M.S.A.E. degree from Iowa State College. Williams was a full-time teacher in the field of farm machinery. Scarborough did research on weed control in cotton and also taught power and machinery. Both, however, ended up as head of a department in another state. Williams left in 1952 to join Texas Technical University at Lubbock and Scarborough in the same year to join a commercial company, later going to the University for Delaware at Newark. After a Bachelor of Science degree in Agricultural Engineering was firmly established, it soon became evident that provision should be made to further one’s formal education both in depth and breadth. The next major step occurred in 1948 with the initiation of a Master of Science program. C. A. Routh was the first student to earn this honor in June 1952. Figure 20. Following graduation he has had an exciting and productive career starting as an Assistant Engineer with the Western Electric Co. He has had 24 years as System Engineer for Western Electric and Bell Telephone Laboratories working on the following government projects: Nike-X, Hercules, Underwater Sound and Safeguard. He is presently Senior Engineer with Western Electric. Out of the 24 years he served two in the U. A. Army, part of that time at the Aberdeen Proving Ground. 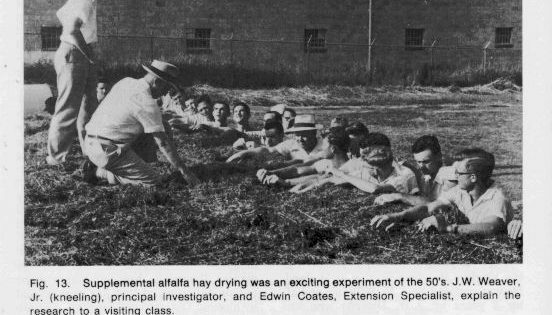 Routh’s thesis was “Leaf and Moisture Loss from Alfalfa Caused by Certain Field-Handling Methods.” One of those methods was the of what is sometimes called the finger-wheel rake. 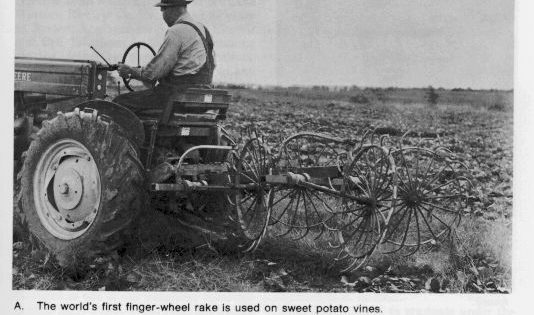 This rake must be recorded as one of our beneficial contributions to agriculture, worldwide. The author has seen one at work as far away as Iran. The U.S. Chamber of Commerce records about one fourth of the manufactured rakes in the United States to be of the finger wheel type. In Europe perhaps 90 percent of the rakes are of this type. One European manufacturer is selling their rakes in the United States. This new finger wheel principle was first invented for removing sweet potato vines for silage. See Figure 21. One day someone said lets try that thing in an adjoining hay field. I worked. Today, after numerous changes and developments by many, both here and abroad, it found its greatest usefulness in raking hay over terraced and uneven terrain—with less loss of plant leaves. Legal documentation places the first work here and, accordingly, Giles was awarded one of the early U.S. Patents. George Wood of Edenton, N. C. is one of the major manufactures and has made tremendous contributions to its development and growth. He first worked for Teter on peanut drying thence with Giles on the rake, finally resigning to go into the manufacture of the rake. It is interesting to note that the principle was also used at that time for cultivating row crops, particularly peanuts. 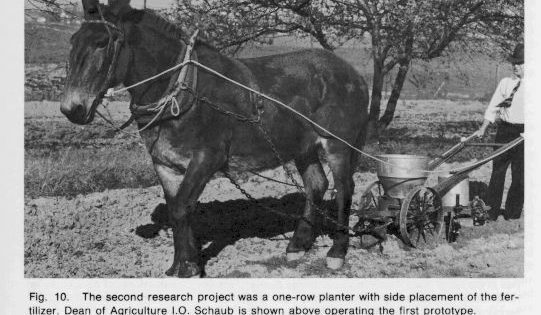 Figure 21B shows it adapted to a horse-drawn cultivator. Like many an invention it was ahead of its time and fell by the wayside temporarily. Today one of the popular mechanical cultivators in the United States utilizes the basic principle of the finger wheel. The Master’s program was redefined in 1954 to strengthen the opportunities in both science and technology. 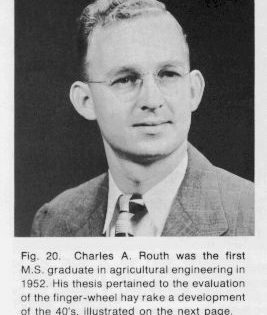 Two programs were offered: (1) a terminal-type professional study, for the technology oriented student, leading to the Master of Agricultural Engineering and (2) a Master of Science program designed primarily for preliminary study to the Ph.D. We previously mentioned that Routh earned the first M.S. in 1952. 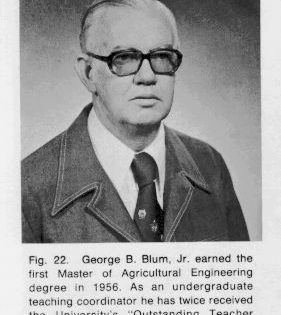 The first student to graduate under the Master’s degree in the area of technology was G. M. Blum, Jr. in January 1956. See Figure 22. E. J. Matthews was a close second, graduating in May 1956. Blum remained with the department starting as an Assistant Instructor in 1950. He became a full professor in 1976. More information concerning his outstanding teaching abilities will be mentioned later. It was also evident that the undergraduate course of study needed restructuring. One reason was to provide a better foundation to each of the two undergraduate programs: Two undergraduate programs emerged: (1) B.S. with a major in Agricultural Engineering Technology; the freshman year for this curriculum was common to all curricula in the School of Agriculture (now School of Agriculture and Life Sciences); (2) B.S. in Agricultural Engineering; this has a common freshman year with the School of Engineering and is administered by the Freshmen Engineering Division. The latter B.S. program came as the result of a study by a joint committee selected be the Deans of Agriculture and Engineering in 1955. It was jointly chaired by C. G. Brennecke, Head of Electrical Engineering and Giles. The result was joint administration of the B.S.A.E. degree. The 1959 catalogue contains this statement under the School of Engineering section: “Since Agricultural Engineering involves two distant technical fields, Agriculture and Engineering, this curriculum is a joint responsibility of the two schools and is so administered.” However, the first students to graduate under this latter program was in 1960. These graduates were listed under the School of Agriculture (and Life Sciences) through 1973. Those graduating In 1974, ’75, and ’76 were listed under the School of Engineering. One will note in Table II in the Appendix that for 4 years (1955-1959) students normally receiving a B.S.A.E. degree now were awarded a Bachelor’s degree. This period was transitional, moving to joint administration with the School of Engineering for the Science type of curriculum only. The Bachelor’s degree terminology conformed with the requirements of the School of Engineering. However, in the academic year, 1958-59, the School of Engineering switched to B.S. degrees, and of course Agricultural Engineering conformed. As indicated earlier, the first student to actually graduate under the joint program came in 1959-60 school year. The move to joint administration was particularly strengthening. The department head had the advantage of sitting on both school’s administrative council. It is not unusual today for a faculty member in Agricultural Engineering to teach a course in the School of Engineering, say in mechanics; secondly, the faculty of the School of Engineering begin to respect the knowledge and the competence of the Agricultural Engineer. Joint administration tied more tightly the marriage strings of Agricultural and Engineering, technically and scientifically. We also started in the 50s a program leading to a B.S. degree in Mechanized Agriculture. After a few years, however, it was incorporated into the not-too-different B.S. degree with a major in Agricultural Engineering Technology (given by the School of Agricultural Engineering and Life Sciences). A total of 37 students earned their Mechanized Agriculture degree. 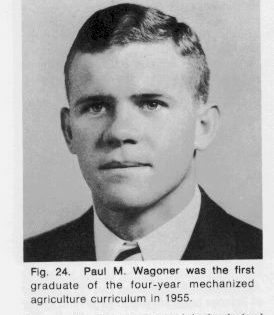 The first to graduate was P. M. Wagoner in 1955. See Figure 24. After graduation, Wagoner operated a major equipment dealership. Today he is an engineer with the Duke Power Company. A significant consequence of the technology program was the formation of the “Technology Club” in 1954-55. However, it was not until 1969-70 that it applied for and was authorized under the ASAE National Council of Student Mechanization Clubs. Its official name was “The N. C. State University Agricultural Engineering Technology Club of ASAE.” This compliments and parallels the Student Branch Chapter, ASAE, mentioned earlier. Blum was their first faculty advisor. Also a notable consequence of joint administration was the accreditation of the department by the Engineering Council for Professional Development in 1958. To achieve the rating required among other values a high level of excellence in both the faculty and physical faculties. In site inspection was one of the rigors of the examination.